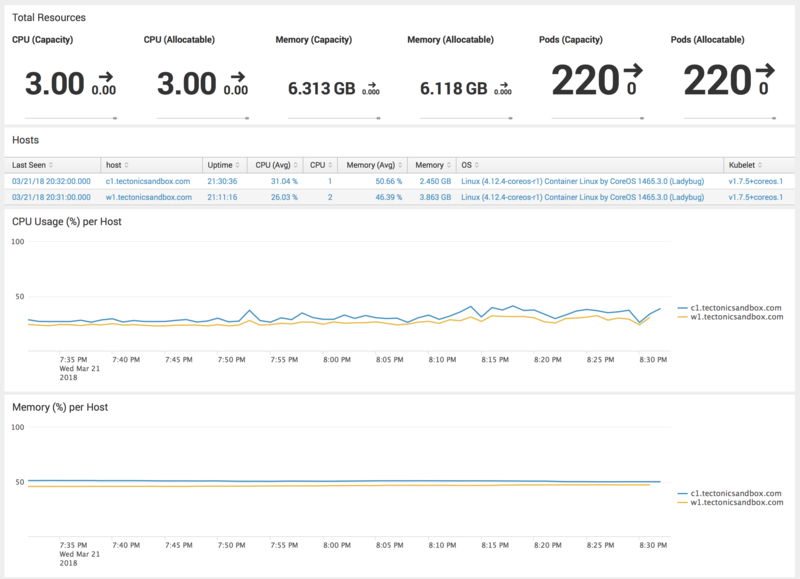 Follow instructions on Monitoring Kubernetes to install collector and application. 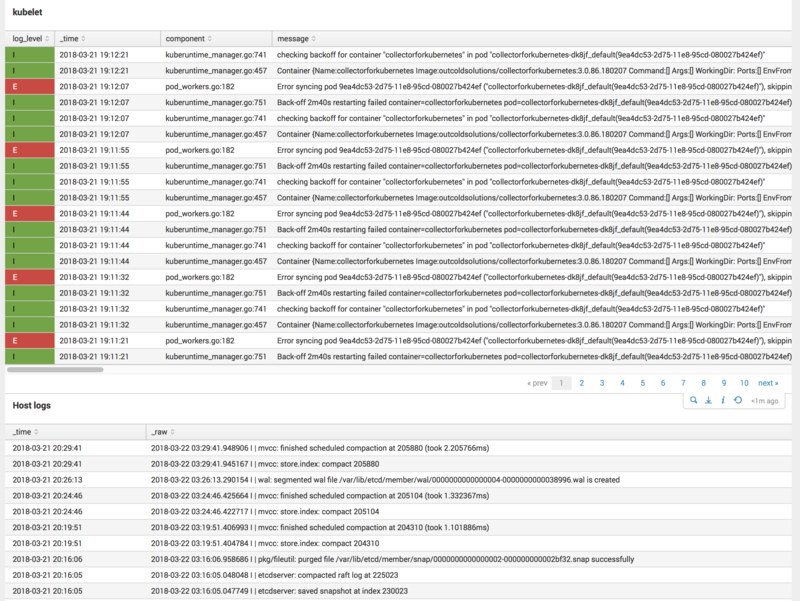 Install DaemonSet with rsyslog, which forwards journald logs to /var/log/syslog. Tectonic is the secure, automated, and hybrid enterprise Kubernetes platform. Built by CoreOS. Our solutions for Monitoring Kubernetes works for most of the distributions of Kubernetes. And it works for Tectonic as well. It just requires small help to get the host logs. Tectonic is using CoreOS as a host Linux for containers. CoreOS is very lightweight Linux, that does not provide package manager and require you to install additional software with containers. CoreOS by default writes all host logs to the journald, which stores them in binary format. In most distributions, like RHEL, we recommend installing rsyslog which automatically configures streaming of all logs from journald to /var/log/. For CoreOS we should do the same, the only difference we will need to install it inside the container. For the image outcoldsolutions/journald-to-syslog I choose debian:stretch as a base image for a simple reason. It has the right version of journalctl, built with the right set of libraries. If you will ssh to one of your CoreOS boxes, you will find out that it journald was built with +LZ4 and it is probably using it as a default. I used rsyslog with imjournal to build this image. As an alternative, you can use syslog-ng with systemd-journal source. Just a default format for the syslog file output. Load journal logs and use the state file /rootfs/var/log/syslog.statefile in case of this container will restart. Create the output channel as a /rootfs/var/log/syslog file, and call /usr/bin/logrotate.sh if file will be larger 10Mb (10485760 bytes). Stream all data (in our case only journal logs) to the created channel from (3). And default configuration to keep five rotated files and rotate when file size is more than 10M (should be in sync with the size we used in rsyslog.conf). To make sure that rsyslog will use the right hostname, and not the one autogenerated by docker, I also created an entrypoint.sh which can set the right hostname before it will start rsyslogd in the foreground. The last step is to schedule journald-to-syslog container. We will schedule it on every Kubernetes node with the DaemonSet workload. line 23 allows us to schedule this DaemonSet on masters as well. line 38 tells journald the right ID, where to look for the journal logs. line 41 helps us to know the hostname of the host Linux. If you have not done that yet, you can install collector and our application in Splunk by following our manual on How to get started with Kubernetes. One small modification is required for Monitoring Kubernetes v3.0 is to change in macro_kubernetes_host_logs_kubelet from syslog_component::kubelet to syslog_component::kubelet*, as in case of Tectonic kubelet process is called kubelet-wrapper.